Directions: Take the Redline to Central and then walk NE on Massachusetts Ave for 2 blocks. I have only been in Boston for a month, and I have already eaten at Life Alive four times. Yes, it really is that good. In fact, Life Alive was the first restaurant I ate at in Boston. Tired after traveling all day and living on airport food, I was wondering where I could go for a delicious and nutritious dinner that wouldn’t break my budget. I googled “healthy restaurants in Cambridge” and Life Alive popped up. Seeing that it was just a few stops away on the Redline in Central Square, I decided to give it a try. Two blocks from the Central Square T-station, I came upon a vibrantly colored restaurant brimming with people. The line for food was to the door, and, hungry after a full day of travel, I almost abandoned it for someplace quicker. However, the delicious smell of their signature “Ginger Nama Shoyu” sauce and the sight of so many eager faces in front of me who didn’t seem to mind the wait convinced me to stay. Fortunately, the line moved quickly and I was soon confronted with the decision of what to order. The menu has a plethora of enticing options. I debated whether I should go for a hot dish such as the “Sami,” which features a “curry miso sauce saturating a flavorful mix of tamari almonds, raisins, shredded carrots, broccoli, dark greens and pearl onions over brown rice with a sprinkle of nutritional yeast,” or a salad such as the “Explorer,” which features their home-made low-fat lentil hummus. I ended up ordering the Sami and one of their innovative “harvest” smoothies. They gave me a number and I headed downstairs to choose a table. Life Alive’s menu features 12 different warm meals, 5 salads, daily soups, fresh-made juices, and 14 smoothies. For each dish, you can choose to have it as a wrap, a “demi” (small-plate), or a filling “bowl.” In addition, if you don’t see something that appeals to you, feel free to mix and match to create your own dish. All meals are made to order from organic ingredients that are delivered fresh daily, and the staff is more than willing to accommodate specific food allergies. Prices for warm meals range from $5 for a “demi” size to $9 for a bowl. Smoothies range from $5 to $9 as well, depending on how many healthy additions, such as aloe and ginger, you choose. In terms of healthy food, Life Alive is unparalleled. 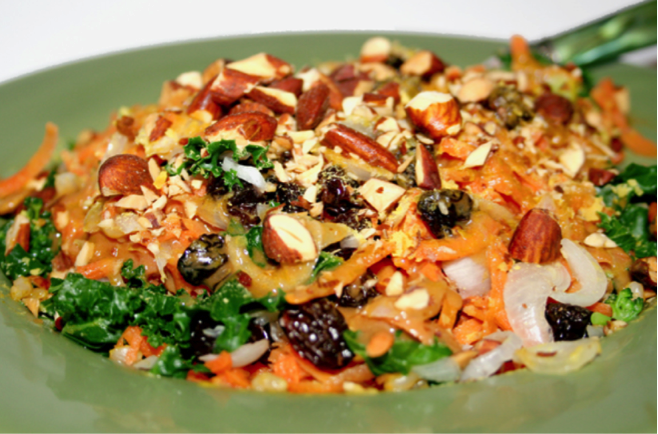 Their menu is full of a variety of organic vegetables, legumes, whole-grains, nuts, and seeds. They do not use any heavily processed ingredients; for example, every day they make their own delicious almond-chia milk using only dates as the sweetener. Life Alive’s mission is to “renew [their customers’] energy and connection[s] to life by soulfully serving [them] the most fantastic, vibrant, organic, therapeutic, whole food [they] could ever imagine.” The restaurant is definitely its fulfilling mission. Life Alive has mastered the art of cooking with wholesome ingredients to create satisfying savory meals, all while managing to stay within a grad student’s budget. Natalie Obermeyer is a first year student in the Nutrition Communication and Masters of Public Health programs. When she is not studying, reading, or writing, she loves to run, hike, ski, play outdoors in the sunshine, and experiment in the kitchen.